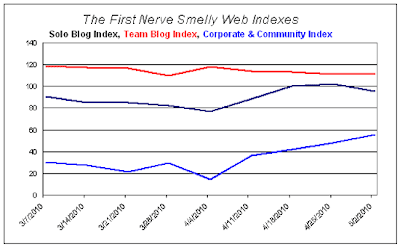 First Nerve: The Smelly Web Indexes: Rollercoaster! The Solo Blog Index reversed course after three straight weekly gains and dropped 7 points as declines outnumbered advances two to one. A big downdraft at IndiePerfumes helped pull the Index lower. The Team Blog Index notched a one point decline for the third week in a row. 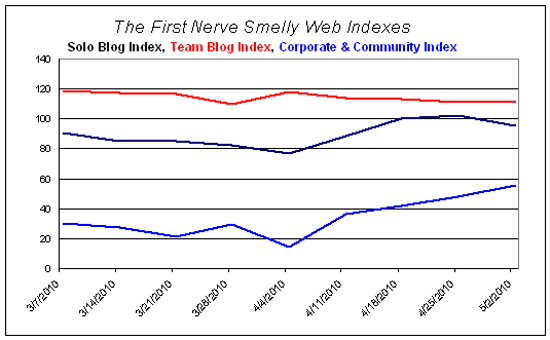 The Corporate & Community Site Index continued to rise driven entirely by a strong showing at Sniffapalooza. hip hip hurray for Sniffa!!! Up is good. But the week-to-week variability makes it tough to be confident about trends in any of the Indexes.